Let’s face it, every SPORTS Bar will be packed to the gills to watch the BIG GAME between the New England Patriots and L.A. Rams. It is sure to be an exciting game (as long as the officials wear their glasses – ha ha)! 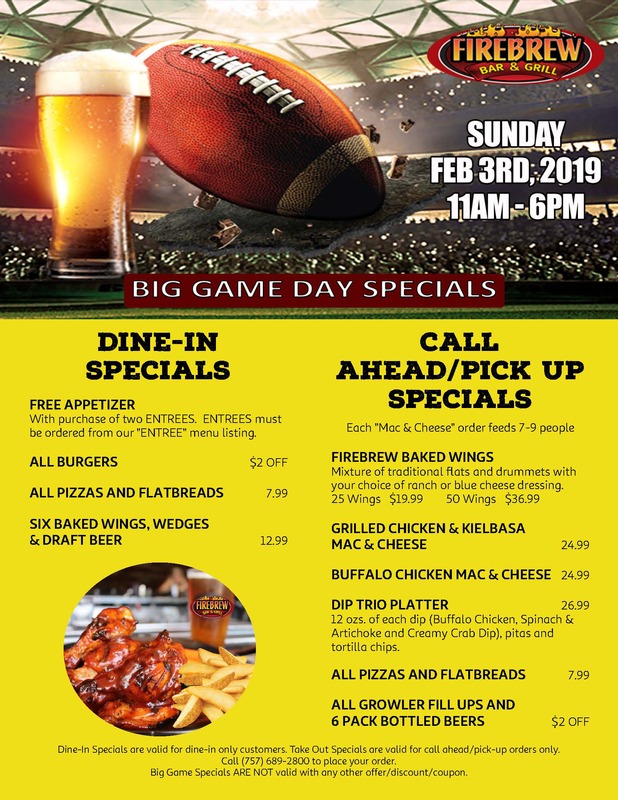 While FIREBREW IS NOT a SPORTS Bar we are offering some FANTASTIC BIG GAME dine-in and Call Ahead/Pick Up specials throughout the day and during the long, long pre-game show (11am – 6pm). So if you are looking to watch the game at a SPORTS Bar — sorry, FIREBREW won’t be your best choice. However, if you are looking for a great place to enjoy a delicious lunch or an early dinner without all the loud uproar of cheering fans or your want to get a great deal for feeding your hungry fans at your home party – well, then check out our BIG GAME SPECIALS (below) for the best deals in town on BIG GAME SUNDAY! Call-Ahead / Pick-up orders for BIG GAME DAY (02/3/19) are accepted now – (757) 689-2800 – until 5pm on 02/03/19. We will be closing at 6pm on 02/03/19. May the best team win!